Sylacauga Airport has infrastructure to offer owner-constructed hangars. The Airport Board in conjunction with several volunteers would like to solicit your assistance in developing a history of the Sylacauga Airport. Should you have information about the airport in Sylacauga, Alabama, especially pictures of the airport regardless of the time frame, it would be greatly appreciated if we could copy those to preserve the history of the airport. Any flyers, pictures, articles, etc., would be most appreciated. 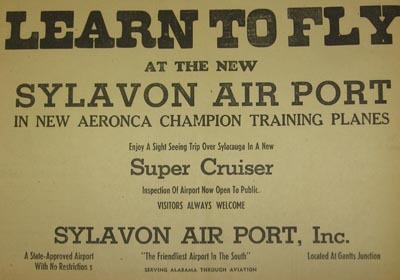 Aviation has been a part of Sylacauga since shortly after WWI. Some pilots used the Hightower farm and a field somewhere in the Brickyard area in the very early days. Probably the first airport was located off the Quarry Road, close to Highway 280 in the area where Pinecrest is today. From there, the first known hangars were erected in an area off the Quarry Road, and the Airport became known as the Hagan Gothard Airport. 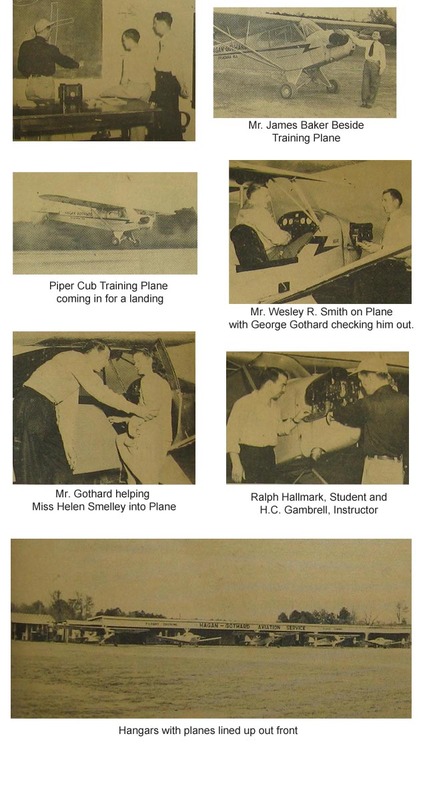 That time frame was in the 1940's, and planes being flown included Piper Cubs, Ercoupes and other aircraft of that vintage. During the early days, Sylacauga had an extremely active airport thanks mostly to individuals that devoted their work and efforts to maintain, improve and add to the utility of the airport. Most of that work was created by the active FBO at the time, Robert "Bob" Smith. With an extremely positive attitude, Bob created numerous aircraft sales from his business efforts and developed a booming student pilot training center. Many of those students are beginning to retire now from positions as airline captains, corporate pilots and flight instructors. Later, in the very early sixties, many of the town leaders were pilots, and they put plans together to take advantage of the push to build every small town an airport that Asa Roundtree started in the early fifties. A new East/West airstrip was laid out between two adjacent land owners along the North end of the existing North/South airport where the Hagan Gothard airport was located. The airport officially opened in 1963 and was known as Lee Merkel Field. Lee Merkel Field has evolved from the original 3000 foot paved runway to the facility it is today. Kimberly Clark, Coosa Newsprint Division, moved some of their aircraft to the Sylacauga Airport and occupied a large hangar the City built to accommodate their needs. KC had a presence at the airport from the early 70's well into the 80's. They started off with a twin engine Cessna 340 and later added two jets to the fleet. 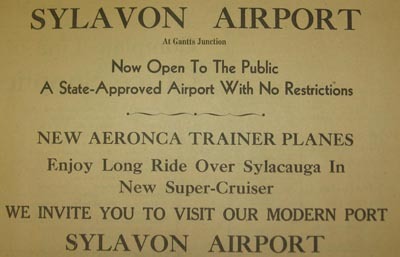 In 1981, Sylacauga had a mayor who truly recognized the need for a better airport. He was a veteran pilot and visionary that could see where aviation was headed in our country. He created the Sylacauga Airport Board and put the active pilots on as members to guide the development of and protection of the airport. Since that time, the airport has had two runway projects to lengthen the runway to 5,350 feet, added a taxiway, relocated the apron and hangars, built a new terminal building and additional hangars and improved the approach areas to accommodate the latest GPS approaches. In 2010, the apron was enlarged to handle aircraft with wingspans up to 125 feet, allowing Sylacauga to compete with other airports in the area for larger corporate activity. In 2012, the City of Sylacauga created the Sylacauga Airport Authority, which currently operates the facility in continuing a long line of continuous operation since 1964. 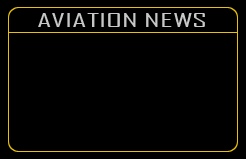 The airport is still very active. With Air Square Aviation, doing aircraft repair and inspection, and active pilots, we continue to be a contributor to general aviation in our area.